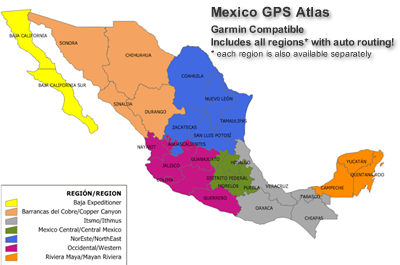 The Mexico GPS Atlas is a downloadable GPS map set for your Garmin receiver. Features include routing, topography, city plans, off road trails and tracks, PEMEX gas stations, major highways and roads, railroads, unpaved roads and some trails, National Parks and Biosphere reserves. Please note that the download will not take place until you have submitted your unit ID and an unlock key has been generated. Includes the locations of thousands of cities and topography at 100 meter contour intervals. Includes 280,000+ towns and rural locations and an extensive points of interest database including geographical features such as beaches, mountains, lakes, dams and rivers. City mapping: Aguascalientes, Colima, Tuxtla Gutiérrez, Durango, Chilpancingo, Morelia, Tepic, Ciudad Victoria, Tlaxcala, Xalapa, Zacatecas, Saltillo and Culiacán. Mexicali, Tijuana, Tecate, Rosarito, San Felipe, Ensenada, Cd. Constitución, San José del Cabo, Cabo San Lucas, La Paz, Campeche, Torreón, Chihuahua, Distrito Federal, Cd. Lerdo, Gomez Palacios, Guanajuato, León, San Miguel de Allende, Acapulco, Pachuca, Guadalajara, Puerto Vallarta, Cuernavaca and Jiutepec. In México State: Atizapán, Tlalnepantla, Naucalpan, Huixquilican, Ecatepec, Nezahualcoyotl, Cuautitlán, Cuautitlan Izcalli, Tultitlan, Coacalco, Toluca and Valle de Bravo. Monterrey, Oaxaca, Puebla, San Andrés Cholula, San Pedro Cholula, Querétaro, Cancun, Cozumel, Playa del Carmen, Chetumal, San Luis Potosí, Mazatlán, Hermosillo, Puerto Peñasco, Villahermosa, Veracruz and Mérida. Urban points of interest such as hospitals, government buildings, shopping centers are included as well as over 1500 PEMEX gas stations along the Mexican highway network. International and state boundaries, lakes, rivers, national parks are also included. Contours at 50 meter (164 Ft) for the Baja Peninsula and 100 meter (328 Ft) interval for the remainder of the country. Requires a MapSource product or MapSource Trip & Waypoint Manager to install in a Nuvi or StreetPilot. The map can also be supplied on an SD card unlocked for your receiver. Compatible with almost any Garmin receiver. Searching capability varies with with model of Garmin product. A sample file is available to test in your receiver. Software is non-returnable. 180MB download (broadband recommended). Submit your GPS Unit ID# at the final check out screen to speed order processing. Here's how to retrieve it from the GPS (ZUMO, NUVI AND STREETPILOT SERIES) 1-Turn the GPS on. 2-Select the Configuration menu (wrench icon). 3-Select SYSTEM (or SETTINGS then SYSTEM on the 200/250 Nuvi). 4-Select the ABOUT option where you will see the GPS ID number. Handhelds - Etrex, 60CSx, 76CSx, etc. : 1-Turn on the GPS. 2-Select the Configuration menu (wrench icon). 3-Select SYSTEM. 4-Press the MENU button. 5-Select Software Version. The GPS ID will show in the lower line. Call with any questions.